The Royal Television Society Northern Ireland Student Awards took place yesterday (Tuesday 28th March) at the Black Box, Belfast. 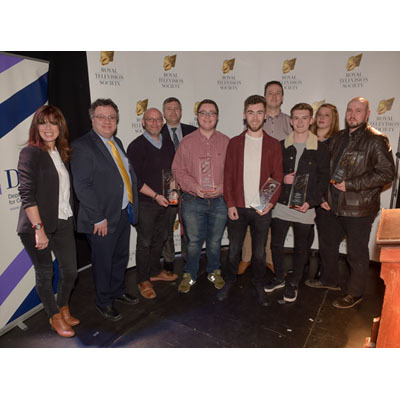 Supported by the Department for Communities as part of Creativity Month 17, the RTS NI Student Awards exist to recognise the importance of education within the television and media industry. Over 100 guests joined host Jacqui Berkeley (BBC), keynote speaker Stephen Nolan (BBC) and RTS NI Student Award 16 national winner (camera work) Seán Murray to toast the rising stars of the creative industries and celebrate the key relationship between the creative sector and the education section. The event highlighted how crucial it is that the sectors work together as political and industry figures joined tutors in supporting the student winners and nominees. Entries came in from almost every Further and Higher Education colleges across Northern Ireland but it was Belfast Metropolitan College who took home three out of five awards last night, with UU enjoying success in the Drama and Animation categories. The winners of the RTS NI Student Television Awards will be automatically put forward to the national RTS Student Media Awards which will be held in London later this year. At these awards they will compete against follow media students at a national UK level. The Royal Television Society is an educational charity promoting the art and science of television. The membership-based organisation works across the UK linking industry with education and celebrating talent across the regions. The RTS Northern Ireland centre organises many innovative events and offers networking opportunities to students, seasoned professionals and all those in-between.